Support for Gradle 1.12, and the new Android Gradle plugin 0.10. If you configure a "resource prefix" for your Android library (see the build system docs), in order to avoid accidental name clashes, Studio will flag all resources that do not conform to the given prefix, and it will also default newly suggested identifiers in the layout editor, create resource dialogs etc to identifiers which begin with the prefix. The outer layout is shown partially translucent to make it more obvious which parts of the layout are editable and part of this layout, and which parts are not. Note also how the Component Tree on the right will list the name of the surrounding layout. When you invoke Extract Include, the included layout is shown in the above way automatically. The layout editor and XML layout preview rendering now supports "hover": as you move your mouse around, the view under the mouse is highlighted slightly and shown with a faint dashed border. This makes it easier to understand the structure of your layout without having to click to select each view. The frequently reported bug where using cut, copy and paste shortcut keys in the property sheet would operate on the whole widgets rather than the property sheet text has been fixed. Ensures that when using the appcompat library, you call the right methods - e.g. getSupportActionBar() instead of getActionBar(). NOTE: This lint check may incorrectly report issues in projects which are not using AppCompat at all. This bug has been fixed and will appear in 0.5.9. Ensures that your menu resource files are using the correct form of showAsAction. A frequent problem for developers manually adding or removing app compat dependencies was forgetting to change between android:showAsAction and app:showAsAction. Worse yet, using the app: namespace one without appcompat could result in an aapt crash. Lint now validates these files. Several checks that have only been available from the lint command line (because they rely on analyzing bytecode, which is not available inside Studio where there is no compile-on-save) have been ported to run incrementally in the editor in Studio. This includes the Parcel creator check, the view constructor check, the wrong draw/layout call check, and the valid fragment check. If you are already running Android Studio, just restart it, or manually check for updates via Help > Check for Update... (on OSX, look in the Android Studio menu). This will download and install a small patch rather than download a full IDE image. 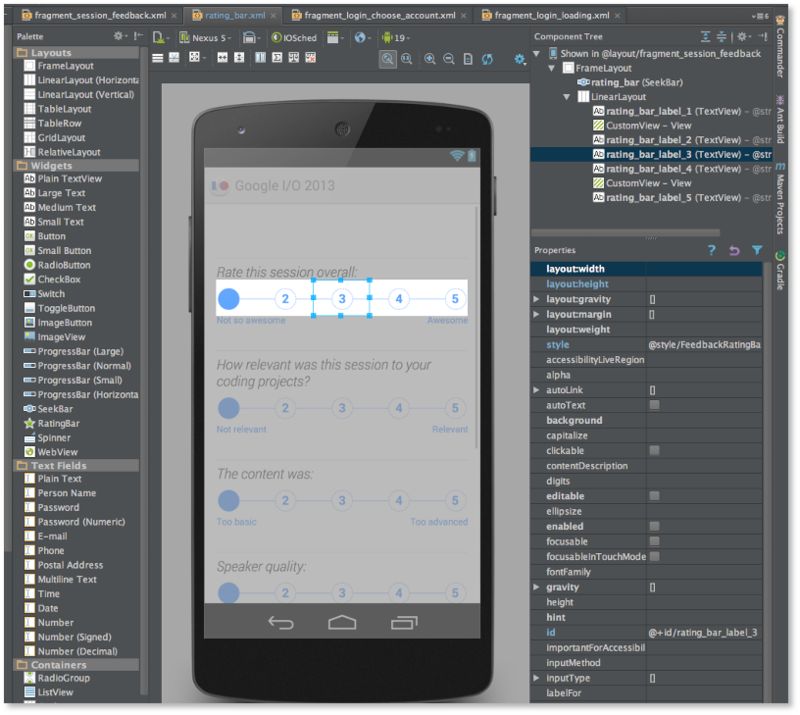 If you need to download a full install, visit the Android Studio Canary Build 0.5.8 page.